I absolutely love being able to shoot at eye level with my subjects. It makes the photo come alive in a way that shooting from the normally elevated position of a vehicle just cannot do. Given, you can get some nice eye-level shots through clever vehicle positioning and using the lay of the land to your advantage. Often, however, the only way to achieve this is to get out and get dirty by lying on the ground (if the reserve you are in allows this). I was able to do just that at Zimanga last weekend as we photographed their dominant Hippo bull thrashing about in the Hlambanyathi dam in sweet golden afternoon light. This spot was next to their new "Lagoon Hide" which is currently under construction and which would definitely warrant a return visit! 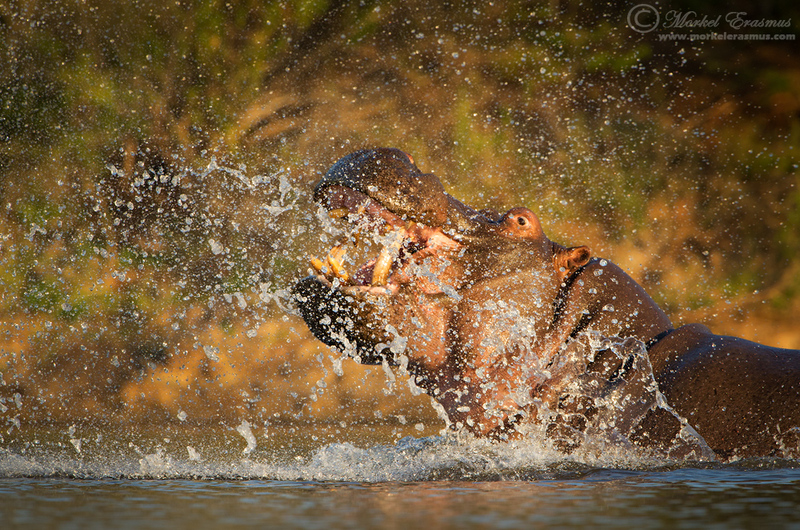 I wanted to focus on the facial expressions of the Hippo and on the resultant splashes, so I fitted the 1.4x teleconverter to my lens for this session. The one concern with these shots is that the camera autofocus will lock onto some of the bigger water splashes that fly towards you, rendering your actual subject out of focus behind the splash. I think this one came out alright, don't you? This is pretty much full frame from the camera. As always, I appreciate your time and attention. Have a superb day! Lovely photo and a great action shot.